XDY-2 Inverted fluorescent microscope is composed with Epi-fluorescent microscope and inverted microscope, equipped excellent UIS optical system and adopted long working distance plan achromatic objectives and wide field eyepieces. Compact and steady main frame body is embodiment for the shock resistance. The enable turning out or into condenser system is suited for observation in a high culture dish. The Epi-fluorescence microscope system is adopted modularization function design idea, so that adjust the fluorescence illuminating system and switching-over fluorescence filters safely and quickly. 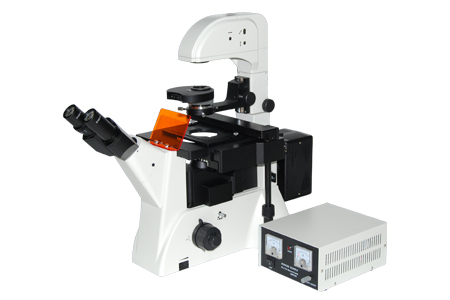 This is a sort of ideal optical instrument for micro observation in cell tissue and transmitted liquid tissue, even in dynamic observation in the culture dish tissue, can be applied in the fluorescence microscopy, such as biological pharmacy, medicine checking and measure, disease prevent and etc. Inclination angle is 45? and interpupillary distance is 53~75mm.